To all of you across Newfoundland and Labrador who raised money and wore pyjamas for Jamarama to show support for kids who stay at the Janeway, your support is everything. THANK YOU! Jamarama is fast approaching—taking place on Friday, October 19th! 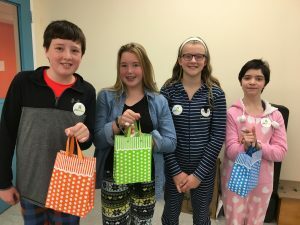 Now in its seventh year, this event has become one of our most important fundraising events, with thousands of kids and adults across the province wearing their pajamas to school or work in support of the Janeway. It’s an event that has everyone feeling all ‘warm and fuzzy’ as every donation helps to ensure the children of Newfoundland and Labrador continue to get the best medical care possible at the Janeway. Taking part in Jamarama is easy! All you have to do is raise money and then, on October 19th, wear your pajamas to school, daycare or work (scroll down to see which pertains to you). 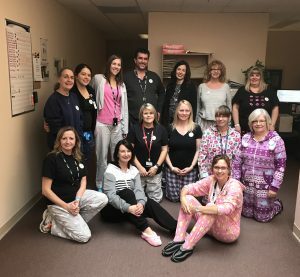 Wearing pajamas is a sign of solidarity and support for the brave kids at the Janeway Hospital who don’t get to change out of their PJs. It lets them know that we understand what they are going through and that we are fighting for them. When it’s a cause this important, no one minds looking a bit silly for a day! Read on to see how to particpate! 1. Once we receive your registration form, we will send you a starter kit for the staff and children (posters, buttons or stickers). 2. By October 19th, each student brings in a donation of $2. 3. Wear your PJs on Jamarama Day! 6. Take photos and share on social media! Tag us on Facebook, Twitter and Instagram and we will share your post. How do we submit our donations? After the event, submit your school’s donation through our website’s donation page (click here), mail a cheque or drop by our office with your donation. 1. Once we receive your registration form, we will send you a starter kit for the staff and children (posters, buttons, stickers). 2. By October 19th, collect donations from family and friends. 3. If you require a pledge sheet now, download and print. 4. Wear your PJs on Jamarama Day! 5. Take photos and share on social media! Tag us on Facebook, Twitter and Instagram and we will share your post. After the event, submit your daycare’s donation through our website’s donation page (click here), mail a cheque or drop by our office with your donation. If your office participated last year, you don’t need to register! Your package will be arriving soon (but let us know if anything changed)! – if you require a pledge sheet now, download and print. 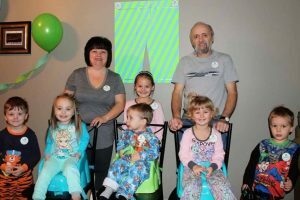 – wear your PJs to work on Jamarama Day! – take photos and share on social media! Tag us on Facebook, Twitter and Instagram and we will share your community involvement. – send in your organization’s donation through our website’s donation page (click here), mail a cheque, or drop by our office with your donation.